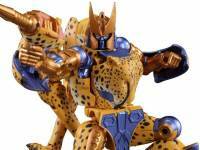 Home » Transformers Masterpiece » Beast Wars Masterpiece Cheetor to be reissued in April 2019? Beautiful figure all around for that size class of MP, (carbot I guess) Cheetor and Sunstreaker are at the top. TT really knocked it out. Hope to see more pics of BA soon. Getting Shadow Panther next. I always thought the floppiness was intentional and not a defect since there is clearly no locking mechanism built into those parts. Yeah more an oversight in engineering than an actual defect. The joint is a lot stronger on my reissue than my original figure though. You appear to have had a really rough time with yours. Mine is a significant improvement over the original. Does the reissue still have that weird, saggy hinge? Thought that was fixed with Shadow Panther. My reissue has a much tighter 'non-saggy' hinge. Pretty much all the joints are a lot tighter. As is the case with any tight joint, hold the part as close to the swivel as possible, and apply firm, but steady force. No sudden movements, and don't don't over-torque the pressure by manipulating the parts away from the joint. There were but they were very few and far between, far less widely reported than Dinobot's shoulders or Megatron's crotch I think. Iirc it was mostly due to tight joints…so see how tight your joints are and take it easy/loosen/apply lubricant if they are over-tight. Unless I've missed something the only reason shoulders are mentioned is because the reissue just has slightly different tooling that allows them to close up fully. They aren't being reported as breaking. The most prominent issue people had was breaking his forearm guards off. Unwarranted force can do some damage to where the forearm guards connect to the yellow piece via pin. When you bring the forearm guards down or up you wanna move them by pushing the yellow piece inside the guard rather than grabbing the arm and moving the guard itself cause that'll put pressure on the pin joint. I have the original release. Any tips on how to prevent shoulder breakages? Be gentle? It wasn’t widespread. It’s a fragile piece is all, so I assume you should just be gentle and be sure to twist and turn things only as they’re intended. My original release is still perfect. And aside from around 5 or less unfortunate collectors I haven’t heard anything else. So you thought you reissue Cheetor came with non-reissue heads? I'm confused..have I got the wrong end of the stick or did you not explain yourself properly? I probably didnt explain myself correctly. Ended up keeping the heads without the overspray on them. No it was the beast mode heads. One has more of an overspray on them and its consistent on all three of them. So you thought your reissue Cheetor came with non-reissue heads? I'm confused..have I got the wrong end of the stick or did you not explain yourself properly? My point was if he has the new shoulder clips he is a reissue…..that's a sure fire was of differentiating them. Isn't that what you were trying to work out? Tolerances on this one were much better than the previous copy. Everything on the first one was way too tight. The shoulders do not come apart when moving the arm.